Various Voices: Poetry, Prose, Politics, 1948-1998. London: Faber & Faber, 1998. First edition of this anthology by the Nobel Prize-winning author. Octavo, original cloth. Boldly signed by Harold Pinter on the title page. Fine in a near fine dust jacket with a touch of wear. Jacket painting by Justin Mortimer. 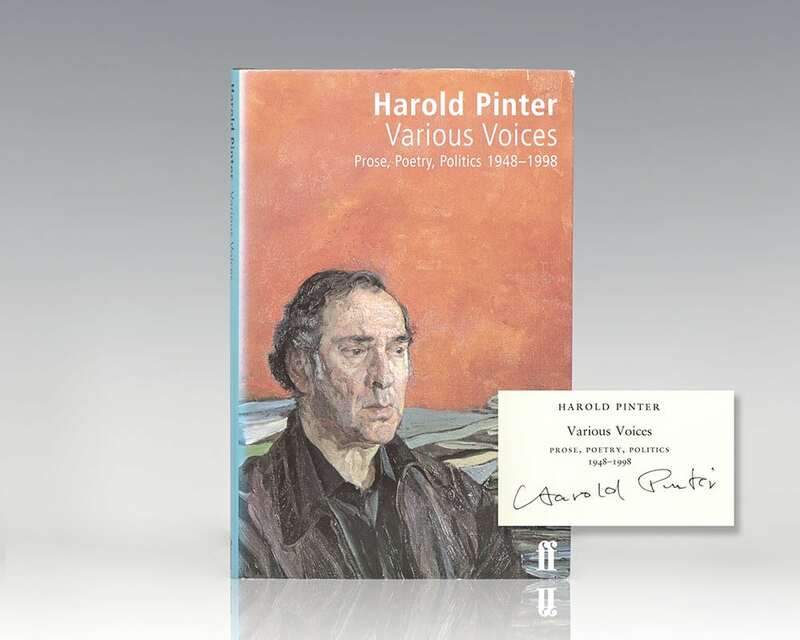 Although best known for his plays, Harold Pinter has also written an extensive and wide-ranging body of other work since 1948; prose, prose fiction, poetry and political writings. In this anthology Pinter presents his own selection, among which are "A Note on Shakespeare" (1950), a paean to the cricketer Len Hutton (1969), the short stories "Kullus" (1949) and "Girls" (1995), the poetry from "School Life" (1948), and political pieces - including many letters to the press - on the United States, Cuba, Kurdistan and Nicaragua. London: Methuen & Co, 1965. 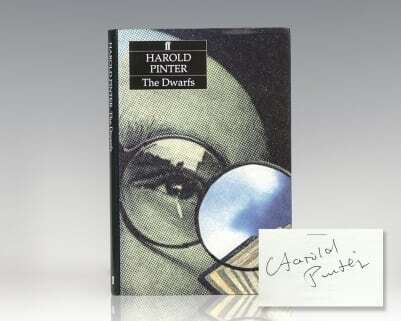 First edition of the two-act play by the Nobel laureate Harold Pinter. Octavo, original black cloth. Signed by Harold Pinter on the title page. “With compliments” slip from Harold Pinter laid in. Fine in a near fine price-clipped dust jacket with light rubbing to the extremities. Also included is a playbill of No Man’s Land signed by Pinter. First edition of one of Pinter’s major works. Octavo, original cloth. Signed by Harold Pinter on the title page. Fine in a fine dust jacket. 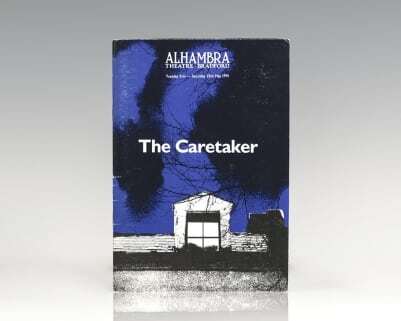 Original Playbill from the May 1991 performance of Harold Pinter’s The Caretaker performed at the Alhambra Theatre. Small octavo, original illustrated wrappers. Rehearsal photographs by Ivan Kynci. Signed by Harold Pinter, Colin Firth, and Donald Pleasence. In near fine condition. London: Methuen & Co., 1960. First edition. Octavo, original wrappers. Signed by Harold Pinter on the title page. Very good in wrappers as issued. Uncommon signed. First edition of this “fascinating work . . . possessing extraordinary power. Masterful” (San Francisco Chronicle). Octavo, original cloth. Boldly signed by Harold Pinter on the title page. Fine in a fine dust jacket. Jacket illustration by Andrzej Klimowski. London: Methuen & Co, 1960. First edition of Pinter’s modern classic. Octavo, original cloth. Signed by Harold Pinter on the title page. Near fine in a near fine dust price-clipped dust jacket with light rubbing to the extremities.